No. 6, Jalan P2/8, Seksyen 2, Bandar Teknologi Kajang, 43500 Semenyih, Selangor, Malaysia. Industrial companies mainly manufacturing and automobile rely on hoist and cranes for lifting metals or raw materials. Overtime, this equipment often reduces in its efficiency and breakdowns. This is when Power Tiek Engineering Works and Services come into the rescue. 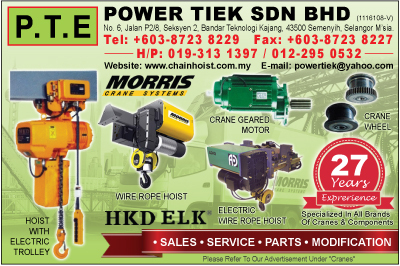 Here we are specialized in hoist, crane and other material handling equipment. Our company consists of a team of highly qualified and skilled technicians and service engineers who are well equipped with service tools and facility to manage hoist and crane repair, service, improvement, installation and commissioning. Based in Kajang, Selangor, Power Tiek Engineering Works and Services has 21 years of experience in this field. 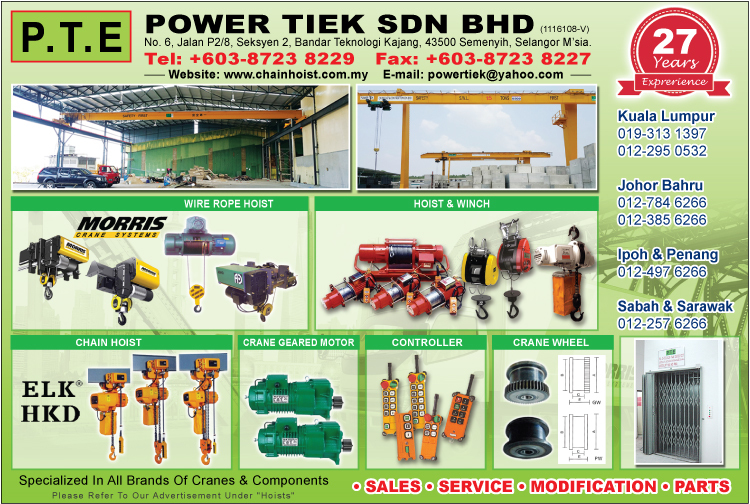 From 2014, Power Tiek Engineering Works and Servuces change their company name to Power Tiek Sdn Bhd.